Just Artificial keeps creating home decorative range of botanically accurate real touch florals. 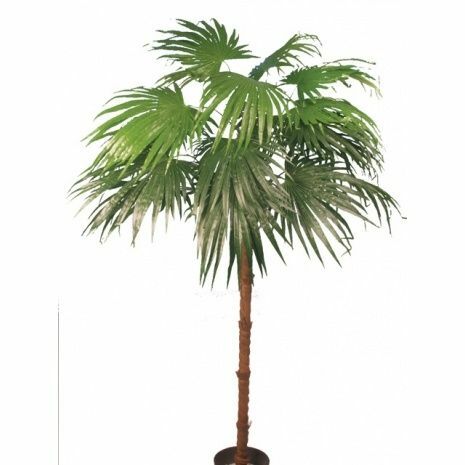 Its finely designed artificial tree – the faux Chinese Fan palm tree embodies their unique approach flawlessly, with the leaves at the top of the top of the trunk/stem. You get a landscaping plant that will not wilt or weep. You get evergreen foliage with almost no maintenance— artificial silken leaves come with a promise of durability! Breathtakingly beautiful and almost real, this imitation plant takes the centre stage for creating natural boundaries or barricades in lobby areas and entryways! These faux plants need zero-maintenance and are a wonderful option for livening-up your living space. Use of premium synthetics means this ficus tree will never wilt as compared to its real life counterpart. Use this artificial tree if you want to avoid the pruning, watering or re-potting.Great for any home, business or event! Comes un-potted ready to plant into a decorative planter of your choice. Un-Potted Products Information: This item is un-potted and does not come in pot. Usually most un-potted smaller plants, trails and bushes have a short tapered stem to use as an anchor to hold them in place. Need to buy some Oasis Floral Foam to help anchor your small and light un-potted products in place? Click here to shop for all our Oasis and Floral Foam sizes and shapes.